A look at the concepts and plays from coach Ibon Navarro that has his MoraBanc Andorra team scoring 90+ points per game. 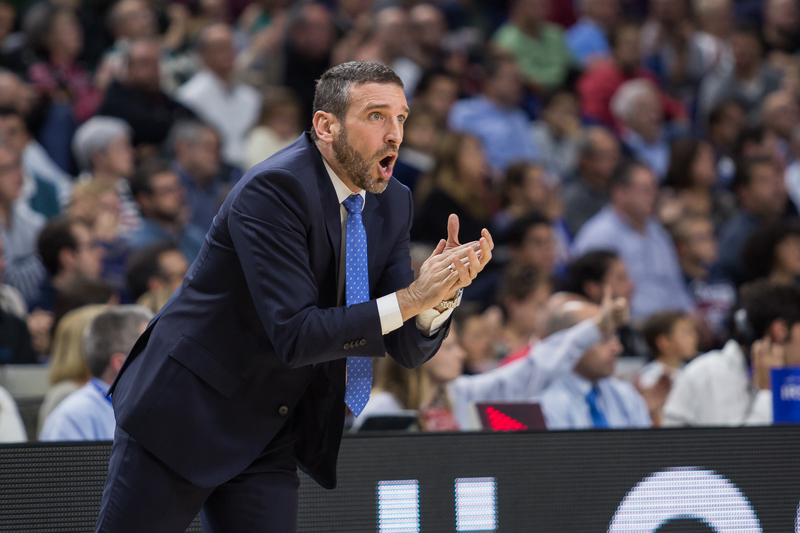 The end of 2018 was a great time for MoraBanc Andorra of the Spanish ACB league. The team grabbed some big wins against Real Madrid and Baskonia, and also was perfect in EuroCup play with three wins in three games. MoraBanc Andorra’s overall 6-1 record in November was incredibly strong. The squad really dominated at offensive end of the floor, scoring 90,6 points per game. It happened due to Head Coach Ibon Navarro and his system. He is one of the most creative coaches in Europe – his players have a clear understanding of what he executes, how he executes it and why he executes it. Lets look at some plays and concepts that coach Navarro employs to allow MoraBanc Andorra to score so effectively. Click on a play to add it to your FastDraw library! The first point to understand is that MoraBanc Andorra really wants to push the ball in transition to score easy points. But if it can not score here, it will flow in early offense, trying to create some good offensive looks out of an Early Stagger Series. The first idea of this series is to create a quick shot in early offense by executing simple things. Every time, 5 will inbound the ball to 1 and become a trailer, as 1 crosses the center line to get into a common 5-out formation. The first option is a shot after stagger. It’s pretty simple and effective, because defenses often try to play in the gaps in transition defense. If the defense starts to overplay on this stagger action and play close to the offense, there is little help on the weak side, creating a huge double gap space. This provides a tasty 1-on-1 iso opportunity for the ball handler to attack the rim. If 2 cannot shoot after the stagger, 5 immediately “chases” to set a ball screen for 2. 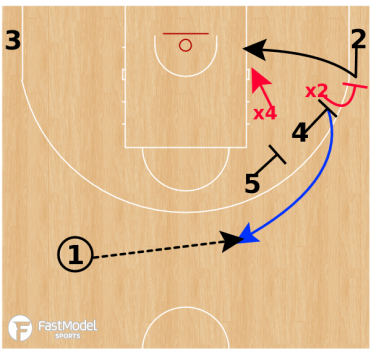 The offense is into a spread PNR with 4 in the strong side corner and 1 and 3 on the weak side drawing the help away so that 5 has advantage rolling to the rim. This is a great counter for MoraBanc Andorra, because they have skilled stretch forwards who can really shoot the three in #30 Reggie Upshaw and #22 John Shurna. Instead of coming of the stagger screen, 2 curls around 4 and screens their own defender. This action often creates a miscommunication between defenders which leads to an open three-point shot, just like in the video below! If x2 starts to play “top lock” defense not allowing 2 to use the stagger screen, then 2 makes a “cheat cut” to the basket. 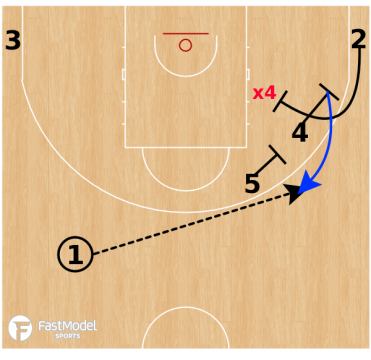 This may result in an open look under the basket, but more likely x4 reacts on this cheat cut, which provides an open three-point shot for 3 off 5’s pin down. I strongly believe in using a series of plays as a coach, because it is much harder for opponents to scout and recognize which set is coming. Coach Navarro shows a nice example of it by executing Iverson Series in MoraBanc Andorra’s Half Court Offense. MoraBanc Andorra have some variations of entries before getting into Iverson action. They can play every action listed next from one of these types of entries. Navarro will also calls this action in SLOB situations. This play creates a huge space for roller (5) under the basket. Nobody can bump 5 on the roll, because x2 and x4 must cover the Iverson screen by 1. This is a common play for #21 Cheikh Moussa Diagne, who is a really strong alley-oop target, as you can see in the video below. 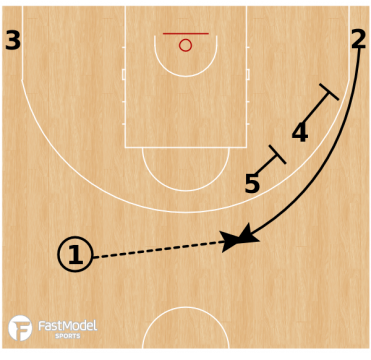 Opposite to previous set, this play creates a Pop opportunity for 5. MoraBanc Andorra use this set for #32 Shane Whittington, who has a solid three-point shooter. This play works perfectly against flat/drop defensive coverage, because x5 cannot guard two things at once. Also, the basket cut from 4 eliminates stunt help from x4. 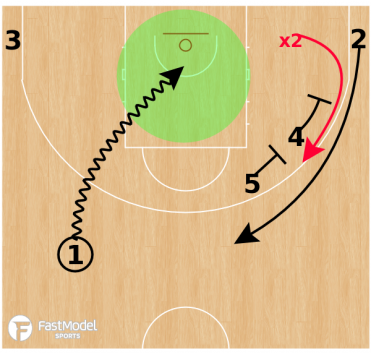 If defender of a ball handler starts sagging off, then MoraBanc Andorra immediately flows into this Double BS action with two possible options for 5, Roll or Pop, depending on 5’s offensive abilities. This is a set coach Navarro likes to use in ATO situations as it creates a gap for 2 to attack their defender 1-on-1 when x2 is not ready. 4 could go underneath 5 or make a shallow cut.